In Sweden we have lots of eggs at Easter, not only chocolate eggs. Boiled eggs served with fish, prawns or some "Kalles Kaviar", which is fish roe out of a tube. I know, it sounds horrible, but the Swedes love it! 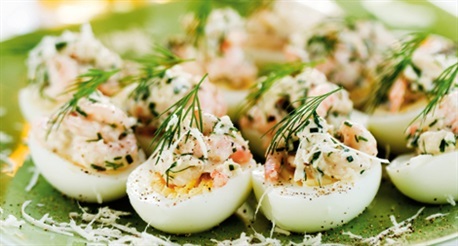 Here is another traditional Easter recipe that you can serve as a part of an Easter buffet. Boil the eggs for 6 minutes. Cool them in cold water before peeling them. Mix prawns, horseradish, dill, chives, mayonnaise, sour cream and black pepper. Cut the eggs lengthwise and dollop the prawn mixture on top. Top off with a little dill, some extra horse radish and black pepper if you wish. Enjoy with cured salmon, potatoes and a salad. Recipe from Swedish magazine "Ica Kuriren".